Fast forward to today, that dream has not only become a reality but InterCoastal Inspections has developed into the leading provider of Commercial/Residential Property Inspections and Thermal Imaging Building Science services in the southeastern states of Florida, Georgia, Alabama and beyond. 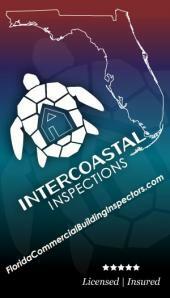 Intercoastal Inspections shall be the premier commercial building and residential inspection business in Florida creating and providing property condition assessments, thermal building science, and phase I & II environmental site assessments (ESA) reporting services of enduring value through a customer-focused and highly-motivated team of professionals. We are not a franchise - our customer service is personalized specifically for you. We will be available for any questions or concerns months after your inspection. We employ strict inspector - client confidential services.